Speed - slower then you can imagine. 1. 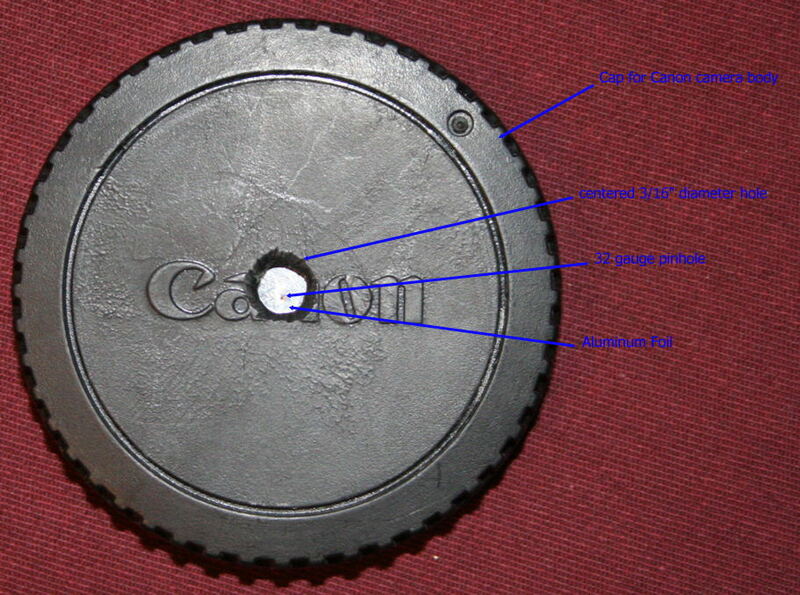 Canon camera body cap. Canon caps because they have a thread are claimed to be light tight. 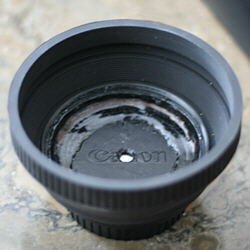 I brought an used cap, so technically this is a used Canon lens. Test out the light tightness of the cap by placing it on the camera body and exposing a shot directly into the sun for 5 seconds or so. The exposure should be completely dark. This test is good for other models and makes of cameras. 3. Plastic film with self adhesive backing. I used the clear 3m film that they apply to the front of automobiles to prevent rocks from chipping the paint. 4. Hollow tip 32 gage needle. I used a new insulin pen needle. 1. Drill a 3/16" hole in the inside center of the cap. Use a piece of wood as a backing so that the hole will be fairly round. Use the knife to clean and deburr the edge of the hole. 2. Cut a donut shaped piece of plastic film 3/4" OD. - 3/16" ID. 3. Cut a 1/2" disc out of the aluminum foil. 4. Flatten the foil by placing on a hard flat surface and rubbing the foil with a piece of cork (drink the wine first). Be careful not to damage the foil. 5. Place the 1/2" foil disc on the backside of the cap, centered over the 3/16" hole. 6. Remove the backing to expose the adhesive on the plastic film donut. 7. Place the film donut sticky-side down centered over the foil, use your fingers or the knife edge to seal the foil between the film and the cap. Make sure the foil is flat and sealed around the complete circumference. Note there should be only foil covering the center of the cap. 8. Place a the cap face up with the bottom of the cap and the foil supported by a small piece of dense stiff foam. 9. Very carefully puncture the center of the foil with the 32 gage needle. The motion of the needle should be straight up and down., any sideways motion or too deep of a penetration will distort the pinhole. Using this method allows you to practice making pinholes and also allows you to inspect the hole before installation. Note that the needle can only be used a few times before it will get dull and has to be replaced. Each different pinhole will have its own unique qualities, ideally the pinhole should be perfectly round, perfectly flat and as thin as possible. This is impossible without buying a manufactured hole (yes you can buy a hole) . Unfortunately my microscope is on loan so I can not actually inspect the pinhole except by holding it up to a light bulb. 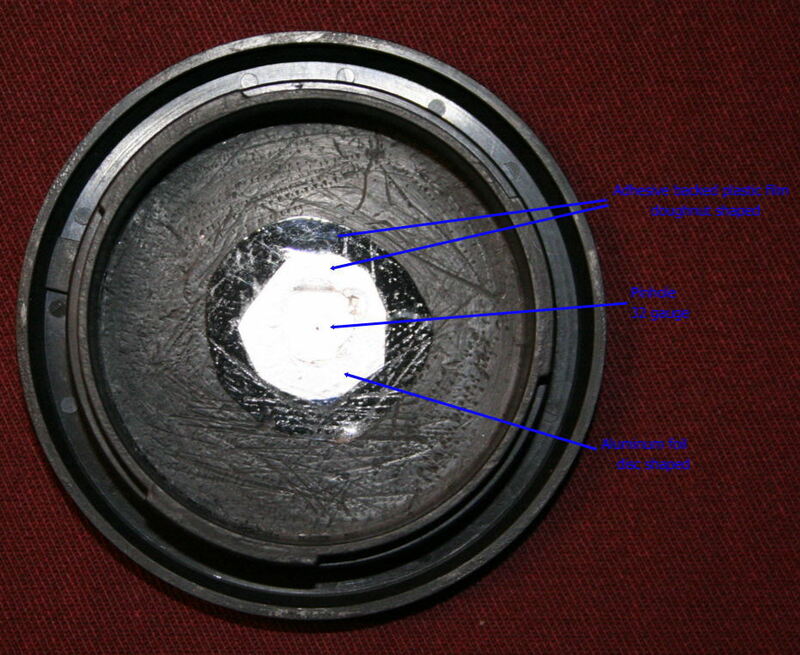 Hopefully I will update the page with actual hole details when I get the microscope back. Alternatively a flatbed film scanner could be used to scan the hole. I originally used plastic tape instead of the film. But it took a couple of trys to get a good (nearly centred) pinhole, I found it was very difficult to remove the gummy residue from the tape backing, I tried soap and water but that did not work. I tried a cleaning fluid but as you can see in the pictures it attacked the plastic cap and messed up the finish. The plastic film has an adhesive that stays with the film even after you remove the film from the cap, this makes replacing the pinhole an easy job. Dimensions except for the pinhole are approximate. Many of the pictures have some contrast lose, some even have a rainbow effect. 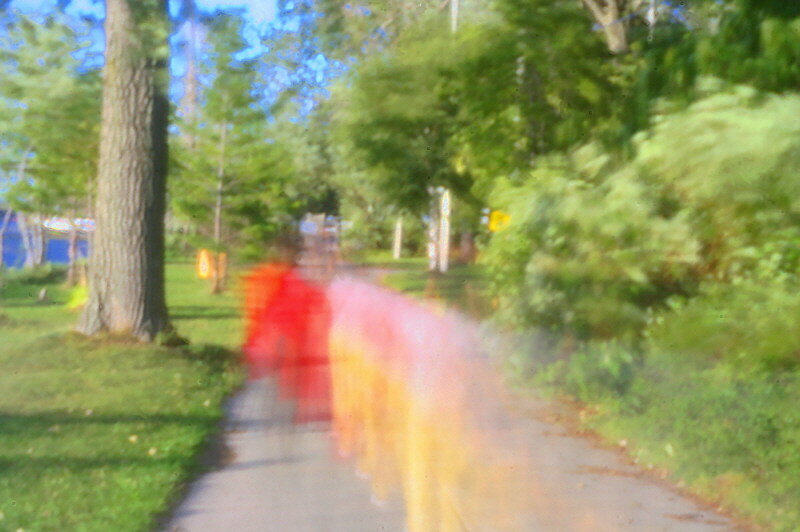 This could be caused by light leakage, a ragged irregular pinhole edge or most likely from the large amount of light that comes through pinhole outside the FOV (field of view) of camera sensor. This light is reflected and diffused onto the sensor. If I shield the lens from off angle light the effect goes away see below for a partial solution.. 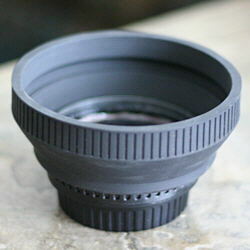 The low resolution of the lens is mostly related to physics. 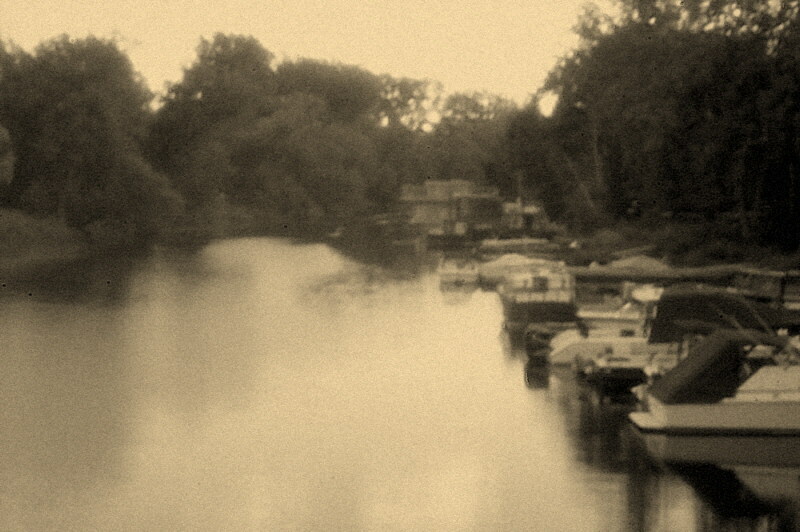 The pinhole is around 0.3 - 0.4mm diameter and a pixel on the camera sensor is many times smaller. The only way to get higher resolution would be to have the camera sensor area much larger, lets say as large as a large format camera. No way on a proconsumer camera! There is also both a diffraction limit and equivalent For a lens hood I brought an inexpensive rubber hood and glued it on with Gloop. The hood allows about a 90° field of view which is still too wide for the pinhole lens.F stop light limitation on the minimum pinhole size. Isabelle Lousberg If her work doesn't inspire you why bother!